In the fall of 2016, a butane explosion at Higher Level Concentrates, a legal cannabis company in Oregon, shook the marijuana community, brought increased scrutiny from regulators, and sent two workers to the hospital. Luckily the two survived, but the calamity spotlights the need for businesses to protect themselves from risk, both before and after tragedy strikes. When Oregon’s OSHA department launched an investigation at Higher Level Concentrates in Astoria, Oregon, they pointed to butane as the likely culprit, but the agency’s investigation continues. Even though Higher Level Concentrates is one of Oregon Health Authority’s authorized marijuana processors, the business had submitted documents for the Oregon Liquor Control Commission, and they seemed to be doing everything by the book, tragedy still took place. Now the company finds itself a party to a lawsuit brought by one of the workers injured in the explosion. Jacob Magley, 34, who stayed a month in a Portland burn unit brought forward the lawsuit against the extract company, the property owner, and the company that supplied the butane. He is seeking $8.9 million in damages because he claims the work conditions were unsafe as he had not been given fire retardant protective gear and was not told about the dangers of butane extraction. What has happened in Oregon is a terrible incident that no one in the cannabis industry would ever want to happen. Unfortunately, catastrophe and heartbreak does occur in work environments. Other industries realize the importance of insurance when calamity disrupts operations. Workers’ compensation: Worker’s compensation insurance protects workers who are harmed at work. In addition to compulsory worker’s compensation insurance as required on a state-by-state basis, employers can purchase additional insurance coverage to better protect the company in case of a catastrophe. Theft: Crime insurance helps companies reduce exposure to risk from crimes like theft or burglary, but also identity theft, forgery, extortion or fraud. Product liability: Product liability insurance protects a company against loss from a law suit over injuries or damages involving one of its products or services. Equipment breakdown: Equipment breakdown insurance doesn’t cover typical wear and tear, but protects a business in the event that key equipment or machinery breaks or malfunctions. Some policies even cover user error. Cyber liability: While some cyber liability insurance policies overlap with equipment and theft insurance policies, they specifically focus on protecting the insured from losses resulting from a data breach such as notifying customers, credit monitoring services, penalties or fines. 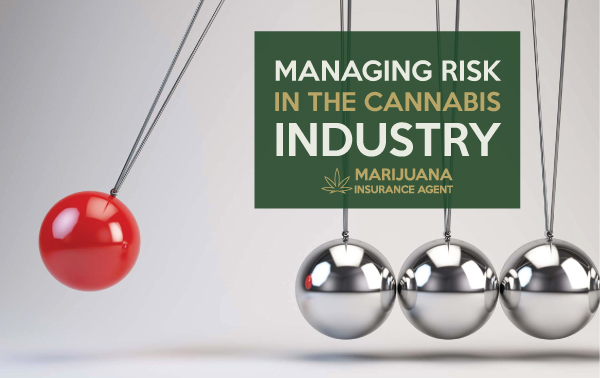 Historically, like many things in the cannabis industry, it has taken longer for insurance companies to jump in to offer their products to the marijuana sector. The ones who first began to do so charged exorbitant prices for their services. Recently, more people have found stability in the cannabis industry and have a clearer picture of what marijuana needs to be adequately covered. The gray area of theft in a heavily cash industry, pollution from growers and processers, and complaints from business neighbors have become more black and white as the industry steps out of the shadows. Likewise, insurance companies have a better understanding of the different needs for all the parts of the cannabis industry, leaving little need to run a business without the everyday security offered by the right insurance policy. With 6 years' experience in business journalism, Brian is the person we turn to for anything related to the business of cannabis. His news coverage spans topics including marijuana business and finance. Brian's work features on themarijuanapages.com, marijuanareferral.com, , marijuanamerchantaccount.com and marijuanainsuranceagent.com.